American Water is the largest publicly traded water and wastewater utility company in the United States, serving approximately 14 million people, in more than 40 states, and parts of Canada. 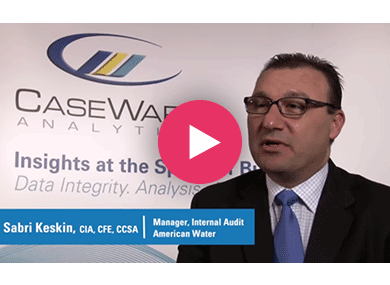 In this interview, Internal Audit Manager, Sabri Keskin, discusses how he uses IDEA® Data Analysis Software to analyze large data sets and help improve efficiency in the business. How Large is Your Internal Audit Department? We have about 10 auditors, that includes our VP of Internal Audit, 3 Managers and 6 Internal Auditors. Being able to accomplish a task while everyone else is saying it’s impossible to do is priceless. I am able to do this using IDEA® and present results within minutes. We are able to analyze very large data sets quickly. You are able to do large data analysis sometimes with other tools but it takes very long and sometimes crashes your system, so we have a lot more efficiency and capabilities using IDEA®. Microsoft® Excel is very useful but with IDEA® we are able to analyze much larger data sets and in a more reliable manner, because there are checks and balances within IDEA where you can’t manipulate the integrity of the data. More importantly, the audit trail (history) function within IDEA® is able to show all steps done, from beginning to end; what was done and the processes followed to arrive at the results, and show that these results are reliable. How Do You Currently Use IDEA® at American Water? We use IDEA® primarily for our audit function to perform data analysis, but more and more we are also using it to support the business when they need data analysis completed to provide advice on improving efficiency in the business. Last month, we received a request from the business to deal with a report which was practically unusable. All they were able to do was look at the last page to find totals; they attempted to use Microsoft® Excel and Microsoft® Access to gain meaningful information from the report without any success. Using IDEA®, within minutes I was able to convert the data using the print report/PDF function to transform the report into a readable format. It was a very basic aging report. I would recommend IDEA® to my colleagues or anyone who is dealing with data and would like to analyze quickly and in a reliable manner.